Incline senior Tanner Quenneville hauls in a catch with a Burney defender in his face during Friday's 35-2 Highlander victory. The three-time defending state champion Incline girls golf team opened the season with a small Division III tournament at Eagle Valley Golf Club last Thursday. Due to high winds, the tournament was only nine holes. Incline and Yerington were the only schools with complete teams, as Sierra Lutheran’s top golfer was out with an illness. The Highlanders posted a low team score of 211 to Yerington’s 268. Incline junior Kennedy Cohn earned tournament medalist honors with a 47. Junior teammate Christine Schwartz fired the second-lowest round, at 49, while Incline senior Tori Findlen posted the third-best score with a 52. Incline’s Kristina Goetz and Bridgette Johnson each carded 63. Incline sophomore Haley Carlson did not compete. Felicia Berumen was Yerington’s top scorer with a 56, and Kami Niles was Sierra Lutheran’s top scorer with a 57. 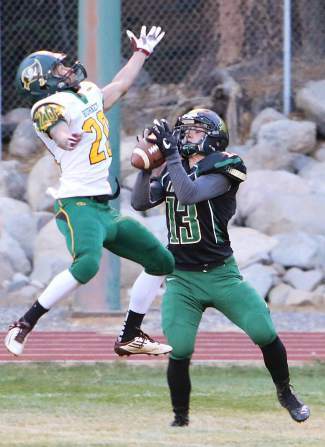 Incline coach Joe Humasti said he expects strong competition this season from Sierra Lutheran and Battle Mountain as the Highlanders seek a fourth consecutive DIII state championship.